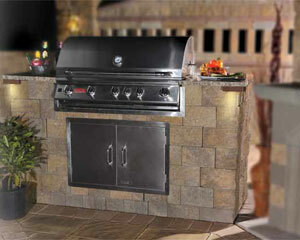 With All Stainless Steel Appliance Packages. 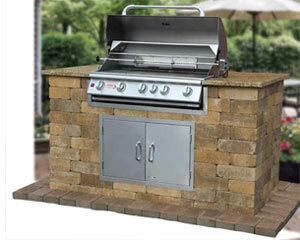 In a smaller scale than the outdoor kitchen kit, the Grill Module is complete with two pallets of Olde English Wallstones and a top of the line Bull™ stainless steel appliance package, all set in a polished granite countertop. The countertop comes in a choice of Black Uba Tuba or Venetian Gold granite. Ready to install… absolutely NO cutting necessary. Step-by-step instructions in English and Spanish included. Dimensions: 75” long, 36” deep and 42” high. Sahara/Chestnut with Venetian Gold granite shown. This style comes complete with 2 pallets of MaytRx 6 Wallstones as well as a top of the line Bull™ stainless steel appliance package, all set in a polished granite countertop in a choice of Black Uba Tuba or Venetian Gold granite. Ready to install… absolutely NO cutting necessary. Step-by-step instructions in English and Spanish included. Dimensions: 75” long, 36” deep, and 42 ” high. MaytRx Split Face Sahara/Chestnut with Venetian Gold granite shown. Lights not included.